A notice of receivership has appeared on YourDay's homepage, the provider of Alton Towers' souvenir DVDs. The YourDay journey hasn't been a smooth one. After making a significant investment in equipment and infrastructure across the park there were numerous delays to the product launch, originally scheduled for the start of the 2007 season. When they finally opened up shop several months later the product was a shadow of what it should have been with only a handful of rides collecting visitor footage, and even those few weren't very reliable at picking up the rider's wristbands. The full ride line-up became available towards the end of the 2008 season but then as Alton Towers opened up for 2009, the shutters remained down on the YourDay shop and the hordes of staff who had been handing out wristbands in 2008 were nowhere to be seen, leading many to question whether YourDay had decided to call it a day. 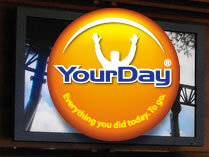 Please be advised that on March 31, 2009, the Essex Superior Court for the Commonwealth of Massachusetts issued an Order Appointing Craig Jalbert of Verdolino & Lowey, P.C., 124 Washington St., Foxboro, MA 02035, as the Receiver of YourDay, Inc. to take control of YourDay's assets and liquidate them for the benefit of its creditors. The Receiver will be selling YourDay's two patents, Patent No. 5576838 and Patent No. 5655053 and its pending patents. If you have any questions concerning the Receivership, please call 508-698-6203 or direct an e-mail to YourDay@vlpc.com. We will try to respond within 24 hours. This leaves the future of the product uncertain, perhaps someone will take YourDay on as a going concern, the equipment and technology could be purchased by Alton Towers or indeed Picsolve and used as part of their own offering, or we could just see the kit ripped out and sold off, with YourDay left to die. Don't rush, walk slowly and take in your surroundings and theming.